After seeing many set photos over the past several months, Netflix has released several official photos for its new "Fuller House" series. An official teaser trailer was released last week giving us a nostalgic tour through the familiar landscape of the Tanner house, but today we get to see D.J. (Candace Cameron Bure,) Stephanie (Jodie Sweetin,) and Kimmy (Andrea Barber) now in the TV sequel's leading roles. 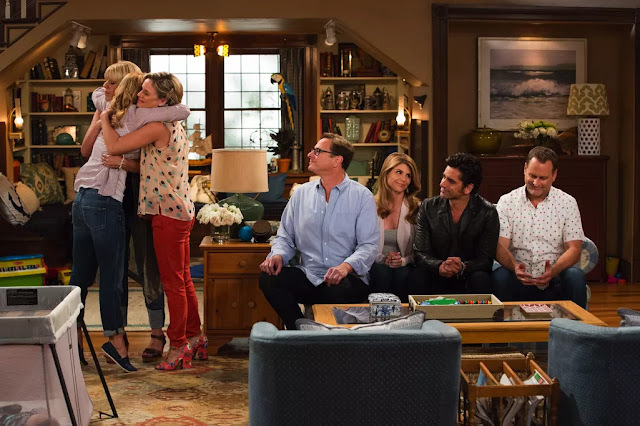 One photo also shows Danny (Bob Saget,) Uncle Jesse (John Stamos,) Rebecca (Lori Laughlin,) and Uncle Joey (Dave Coulier) in their now recurring roles looking on as the girls embrace. The first season of 13 episodes premieres February 26 on Netflix.